Posted October 11th, 2017 by Mary Ann Hooper & filed under Past newsletters. This newsletter includes items on the Re-wilding talk, activism against fracking, recycling in Wirksworth, a Transition Network survey, the Transition Regional Network project, setting up a Renewables company in North Derbyshire, and APPLES! 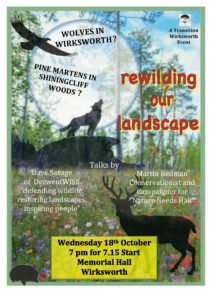 You may already have seen Moira Knowles’ visionary poster around town, but just to remind you – please come along on Wed. 18th October 7pm to Memorial Hall to find out more about local attempts to preserve and protect other species in our local landscape…and to contribute you own ideas! Meeters and greeters to be there about 6.30 pm; one or two people to bring apple cake and serve cake and soft drinks – elderflower cordial etc – at the break.Please contact Rosemary on hernesrose@w3z.co.uk or on 07904 783818 if you can help. See you there! Our next anti-fracking action is in Sheffield on Saturday 14th October, as part of a global day of action against fracking. We are travelling by the 8.40am bus from Wirksworth and the 9.10 X17 bus from Matlock bus station. The demonstration is at Barkers Pool, Sheffield, from 10.30am to 12noon. Why not join us? A small group from Bakewell, Bonsall, Matlock and Wirksworth travelled together to join hundreds of others in the anti-fracking marches from Mosborough, Eckington and Coal Aston to the proposed drilling site at Marsh Lane on 16th September, followed by a rally in the field adjacent to the proposed site. Of special interest was a speaker was from the renewable energy company, Ecotricity, who have decided to set up a fund to help finance anti-fracking protests [many protesters are being prosecuted as they have been left with no choice but to take direct action]. Ecotricity will put £50 into the fund for each new customer. If you are still with one of the major energy suppliers but want to support the renewable energy industry and the anti-fracking protests, why not change to Ecotricity, who not only sell but also generate green electricity and some “green gas”. [Many so called Green energy suppliers are merely retailers and do not actually generate any renewable energy at all]. Reduce your non-recyclable waste by always requesting “no polystyrene tray please” when buying food from the Wirksworth fish and chip shop. If enough of us ask, they may start to consider using a more environmental friendly container. This charity gives old furniture a new lease of life, helps provide volunteers with useful skills, provides furniture to people in need as well as having a charity shop and, transport permitting, collecting furniture for reuse. Some time ago, their van broke down and they are still trying to raise money to replace it. See http://www.revivalfurnitureproject.co.uk . 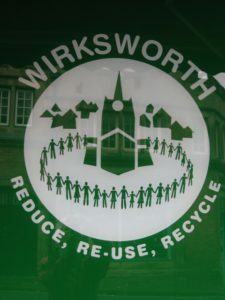 The Wirksworth Transition recycling group wants to encourage as much recycling as possible. If you want to know whether or where an item can be recycled, go to http://www.derbyshiredales.gov.uk/environment-and-waste/bins-recycling/a-to-z-of-waste/1210-b to check their A to Z list. Still confused? Contact the recycling group on hilaryhebron@gmail.com and we will attempt to answer your query. Renewables company in North Derbyshire? A small group in the Hope Valley have been discussing the possibility of establishing a community & social enterprise renewable energy business locally, along the lines of Sheffield Renewables.Click here to see a 5 minute video. “We’re keen to get feedback from the movement about what is happening for Transition groups. We’re starting by sending out a short survey of three initial open questions. We are keen to support the flow of information, inspiration and connection around the movement, so anyone who participates in this survey will be able to see all the responses. Please join the conversation about how a Transition Hub for England and Wales could support Groups and Regional Networks as well as connect with the International Transition Scene. The project is currently developing a funding proposal for a new phase of work to build on the workshops, support literature and UK wide mapping of Transition carried out in 2016/17. They would like to get your feedback on this proposal as well as presenting to you some of the initial research findings from the Workshops. How can groups around the country be better supported? Two online two-hour meetings on the 23rd and 30th October will do this, but you only need to attend one as they are the same, to give as many people the option to participate. The successful Apple Day stall at the October Farmers Market will be repeated at the November 4 Farmers Market. Bring apples to be juiced, sample heritage varieties, snack on a piece of apple cake! Cromford Apple Day this Saturday 14th Oct.
On Sunday 29th October Transition Hope Valley will be celebrating Apple Day at the Quaker Community in Bamford in the Hope Valley from 1230 to 4pm. The annual celebration of all things appley includes apple based food, games and, most important of all, an opportunity to press your own apples so you can enjoy the juice from your own trees. This year there will also be a couple of drumming workshops during the afternoon sponsored by Bamford Community Arts and Crafts. You can also enjoy a guided tour of Bamford’s Ecohouse, and talk to apple experts about varieties and techniques, plus lots of other stands and displays. The group welcome fellow transitioners to join them for a fun day out. The event is a 400m walk from Bamford Station and bus stop and there is plenty of parking available. (Park for a £2 climate change tax.) Look for the apple signs.